"Defendants authored various versions of the SamSam Ransomware, which was designed to encrypt data on Victim computers. SamSam Ransomware was designed to maximize the damage caused to the Victim by, for instance, also encrypting backups of the targeted computers," the indictment says. "Defendants used a variety of methods to gain access to Victim computer networks, including exploiting known security vulnerabilities in common server software and utilizing virtual private servers such as European VPS #1 and European VPS #2 to mask their identities." Once on the entire network, SamSam encrypts the system's data and demands a huge ransom payment (usually more than $50,000 which is much higher than normal) in Bitcoin in exchange for the decryption keys. "According to the indictment, [affected victims includes] the City of Atlanta, the City of Newark, the Port of San Diego, the Colorado Department of Transportation, the University of Calgary, Hollywood Presbyterian Medical Centers, Kansas Heart Hospital, MedStar Health, Nebraska Orthopedic Hospital, and Allscripts Healthcare Solutions Inc."
The Atlanta city's officials refused to pay the ransomware, and the recovery effort cost them estimated $17 million. 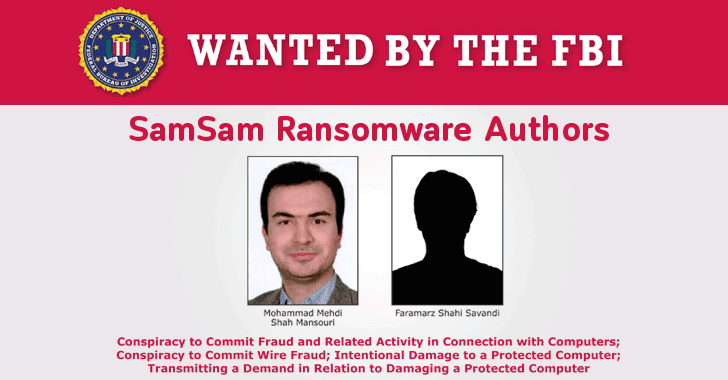 Leaving behind other well-known ransomware viruses like WannaCry and NotPetya, SamSam became the largest paid ransomware of its kind with one individual victim paid $64,000. Since Iran has no extradition policy with the United States, the indictment may not guarantee the extraditions or convictions of the two alleged hackers. But being on the wanted list of the FBI make it difficult for the duo to travel outside their country’s boundary freely.